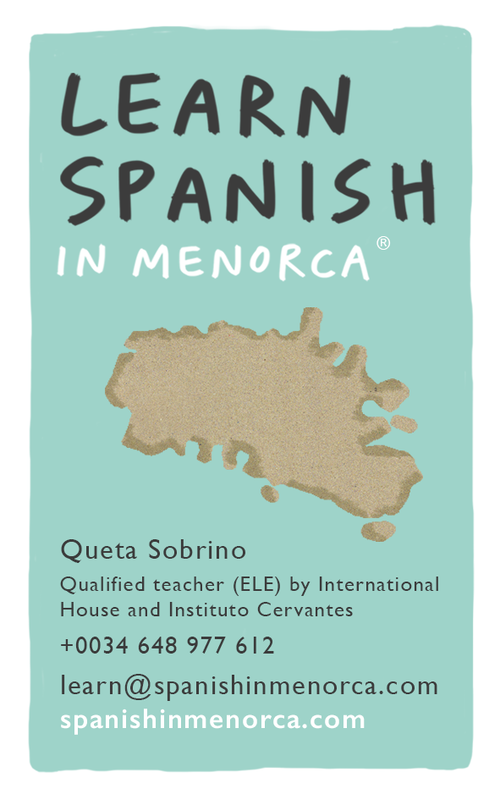 School Learn Spanish in Menorca or Online. Your teacher. Hello, I’m Queta, the head teacher and founder of L.S.inM. If you want to meet, GET IN TOUCH! and in less than 48h we can arrange the first free lesson/ interview face to face or online . The constancy is your key. You don’t need to spend a lot of hours in the classroom to learn Spanish in a efficient way. Instead choose a plan and times that suit your needs and are tailored to your interest. You’ll see how much progress you can make in a short time when you are engaged. Don’t be afraid to make mistakes, but above all: talk, have fun. Step by step you will get it and you will be truly expressive. We work one to one or in very small groups (see course hourly fees) in sessions lasting from a couple of hours to a couple of weeks. We have carefully selected teachers & learning facilities in Mahon. And we can also come to your location wherever you are. We also offer more specific programs (such as Bildungsurlaub) available upon student’s request. And online lessons too! Active Spanish means learning the language by study and action – by shopping and dining and working and conversation. You can multiply the many benefits of the beautiful island of Menorca by speaking its language – if you’re able to order drinks and meals, ask for assistance, buy things and express your needs and opinions doors will open for you, and your welcome will be even warmer! We have a wide range of exciting learning solutions from wining & dining Spanish to working Spanish. Check our current range of Courses & Prices. We work with tour operators, hotels, educational institutions and individuals to provide tailored services that meet the needs of students, holiday makers and residents. If you have any specific needs do not hesitate to ask! Contact us in person, by phone or email. The School Learn Spanish in Menorca ® is the island’s wide provider of active Spanish. We also work with local business and community and environmental groups to ensure that visitors can learn from Menorca. Our work is integral to the efforts of the island departments of Education, Culture, Environment & Tourism. Contact Get in touch – say ¡hola! Thank you very much for a week full of learning, laughter, information and culture, for all your work and for everything you two did for us during our stay in Mahon! Enriqueta and Carmen were wonderful and patient teachers, they found out what we needed in no time and tought us everything we asked for – it was superb! I hope to come back one day and I hope we stay in contact – and I will go on learning spanish as good and as fast as possible :)! Minorca é un ottimo posto dove studiare spagnolo e learnspanishinmenorca é la scuola migliore, al pari del cervantes dove ho studiato in passato. Inoltre l’ambiente é accogliente e piacevole e Enriqueta é un’ insegnante entusiasta e competente. Ho fatto progressi incredibili in una settimana di corso quindi la consiglio vivamente a tutti!